Boys Town 22.1, 1936 Boys Town Charity Seal. The first Boys Town Christmas Seal was issued in 1936, and is somewhat scarce. This seal is fresh, and lightly hinged, with sound gum. Heart shaped red and purple seal. Boy with outstretched arms. 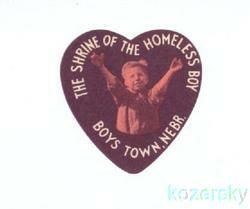 "The Shrine of the Homeless Boy - Boys Town, Nebr."